Kettering Town were on the spot to beat AFC Rushden & Diamonds in a penalty shoot-out to book their place in the NFA Hillier Senior Cup final after the two teams battled out a thrilling 3-3 draw at Latimer Park. Unfortunately, events were overshadowed by an alleged incident in the tunnel at half-time which resulted in the police delaying the start of the second half. Neither team’s coaching staff commented on the incident immediately after the game and it is understood to be in the hands of Northamptonshire Police. On the pitch, both sides warmed up the freezing souls who made the effort to turn out on a bitterly cold night. Diamonds were excellent in the opening period and took the lead early on when Ryan Robbins headed home Joel Gyasi’s near-post free-kick. And if that was good, it got even better when Robbins doubled the advantage. From a Kettering corner, Callum Westwood broke with pace and threaded the ball through to the frontman who made no mistake with a firm finish into the corner after his first effort had been blocked. The Poppies were unable to find any sort of rhythm with Diamonds playing like a team who have been unbeaten in their last 15 league matches. But the hosts were handed a lifeline on the stroke of half-time when Kalern Thomas was brought down in the area and Brett Solkhon stepped up to convert the resulting penalty. Marcus Law threw on Ben Toseland and Lindon Meikle for the second half and the Poppies were much better as they dominated possession for long periods. They levelled the scores up when Rene Howe nodded home a corner from the left. And they thought they had won it late on when Aaron O’Connor released substitute Rhys Hoenes who raced away before beating Ben Heath. That sparked wild and, perhaps, over the top celebrations from the Poppies players and staff but Diamonds weren’t done. A long throw caused havoc in the Kettering penalty area and the ball eventually fell to Diamonds captain Liam Dolman who found the bottom corner to spark equally crazy celebrations in the away dugout. A draw meant an instant penalty shoot-out and after five successful kicks, Ross Oulton saw his spot-kick saved by Paul White. 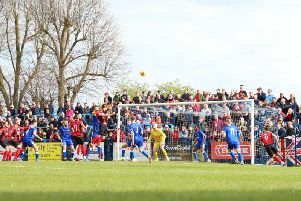 Howe and Tom Lorraine converted and then, with a chance to win it, Thomas ballooned his over the bar before Westwood scored to send it into sudden death. Toseland kept his cool but Gyasi fluffed his lines with his penalty going wide of the mark, much to the delight of Kettering’s players and fans. Thankfully, a stormy old night ended in plenty of handshakes but it is Kettering will now meet Brackley Town in the final.